Utility trucks are used by contractors and commercial personnel to help complete some of the most demanding work. These trucks must be able to transport heavy and often bulky equipment to and from the job site in a safe and secured manner. Without the use of these trucks many contractors and commercial personnel would not be able to complete their jobs.The factory paint protecting these vehicles will quickly wear away, allowing severe rust to corrode the bed and tops of the cabinets. LINE-X of Orange County has sprayed thousands of utility trucks for contractors and tradesmen over the years and we know what it takes to keep your work vehicle protected for years to come. 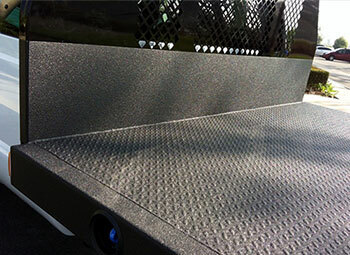 LINE-X protective coatings have virtually unlimited applications potential for any business serious about protecting and prolonging the life of its assets – be it utility trucks, specialized equipment or providing a safer employee environment. LINE-X coatings are designed to create an impenetrable barrier between valuable equipment and nature’s harshest elements, such as high humidity, salt water or extreme temperature changes. Laboratory tests demonstrate excellent levels of abrasion and impact resistance under just about any severe-use condition. LINE-X outperformed all other leading materials, including carbon and stainless steel. LINE-X coatings are ideal for secondary containment applications, providing an additional layer of environmental protection wherever petroleum products or chemicals are stored. A safe, non-slip surface is required for all work environments, including floors, stairwells, ramps, catwalks and other elevated structures. 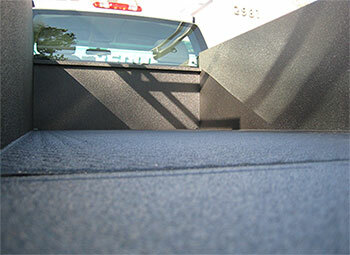 LINE-X coatings deliver this, along with sound-deadening and vibration-damping characteristics. Additional charges apply for specific requests and items that will need removed or masked prior to spraying, such as ladder racks and toolboxes. LINE-X has plenty of options for your vehicle or anything that needs protected. We can do more than just spray your work vehicle! We are your one stop shop for complete vehicle up-fitting. 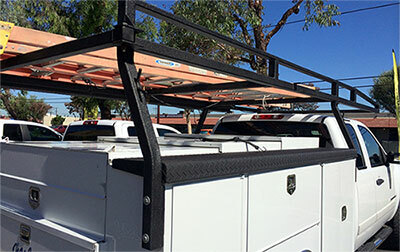 We sell everything a contractor would need for his work vehicle, from toolboxes and storage capabilities to ladder racks and cab protectors. Enter your vehicle info and search by year make and model or give us a call to find out what we have to offer.